In the middle of another late frost advisory I thought it was about high time to finally post something of the tornado we had about a month ago. 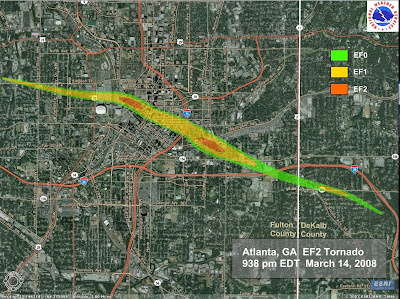 It ran through downtown and then hit Cabbagetown, but little known to everyone is that it continued south and east into East Atlanta. We haven’t attracted as much attention from the press and the volunteer corps but quite a few houses were hit hard over here. Luckily we were about one block south of the real damage. We only lost a ‘small’ cedar in the front between our house and the neighbor. Several houses had damage from debris, if not a whole tree, hitting them. from Mikey about the NCAA basketball in the Georgia Dome. We expect that this type of event is a rarity and hope not to see our house crushed by the massive trees that surround it. That’s a cool map that hadn’t made it my way yet. One thing you could do for the out-of-towners is demarcate the location of vargo-Stockman manor. Lauren hates to have personal info up on public sites (I say to the guy with the private blog). Thanks for the shout out. You know I only ask because I care, about basketball. But seriously, i’m glad the tree was the “only” damage at your place.